The benefits of becoming a member of an Officially Affiliated Club, are that you can acquire an official CONGU handicap. This allows the player to play in all Club Competitions and at Courses that require you to have a valid Handicap and proof of Handicap in the form of an Official Handicap Certificate or Central Database Handicap ID number. Please email us or telephone 01400 250796 or 250111 and we will send you the appropriate forms. 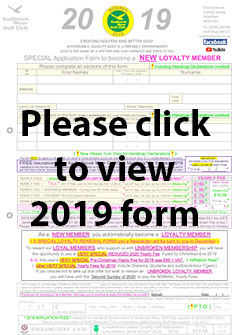 Or please download the membership form from this website from the image below and send it to us. All credit cards and cheques accepted. When we have received your completed form we will send your bag tag and membership badge. Please click here to view our New Member Handicap Flow Chart and below for the 2017 Form. We will then be looking forward to seeing you and PLEASE BE ASSURED OF A FRIENDLY WELCOME. You will receive your renewal form and newsletter through the post in December. We are sure you will want to rejoin, when you have enjoyed our affordable, quality golf and hospitality, together with all of the other benefits associated with Golf Club Membership.